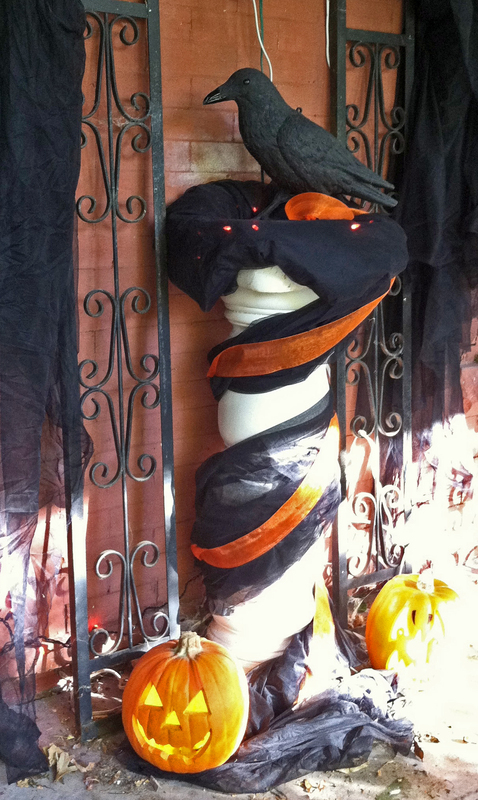 How I Did My Yard for Halloween This Year…And it’s All on the Cheap, of Course. The Front Gate. The 2 pots are changed out every season. 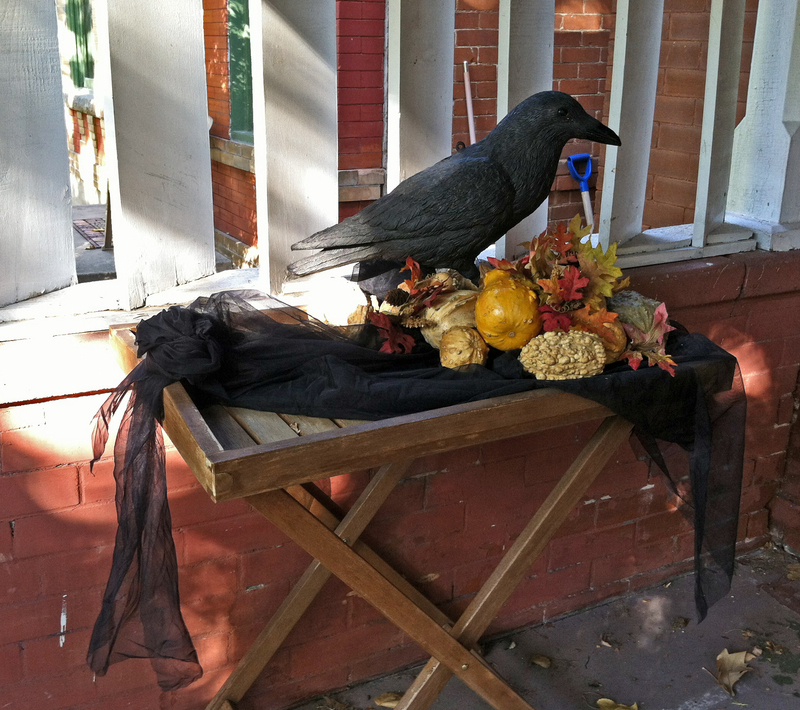 This year I simply added fake Fall foliage and my beloved Crow decoys. 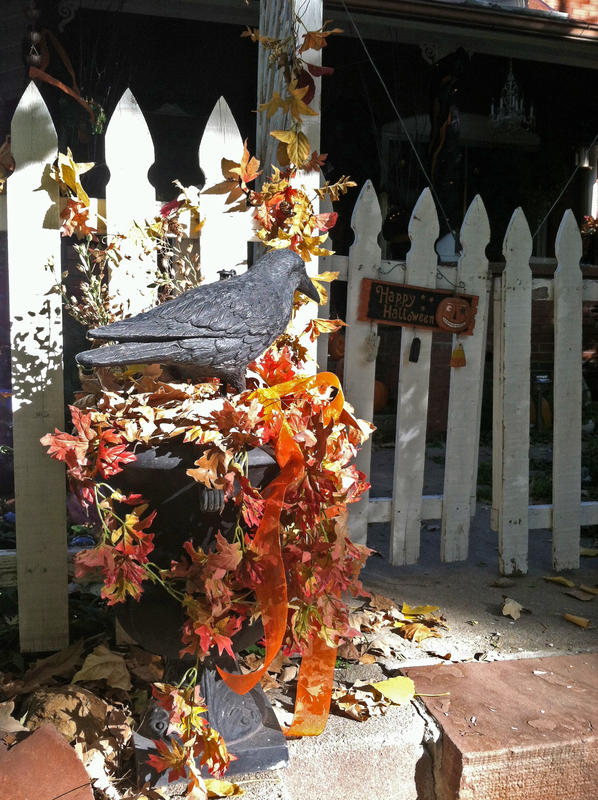 All my Fall foliage was been gathered over the years at thrift stores for a couple bucks a piece. 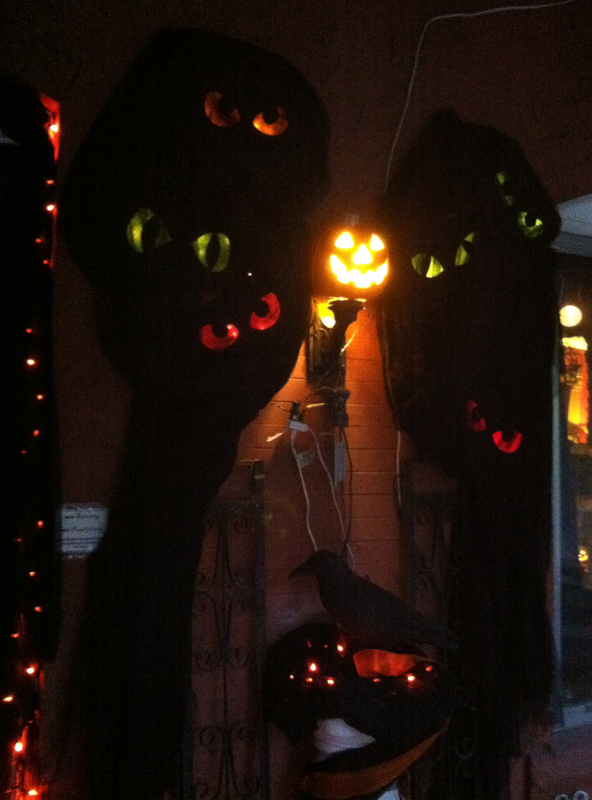 I scored all my crow decoys on Ebay. I’ve had them for about a decade and still love using them every year. They are indestructible! 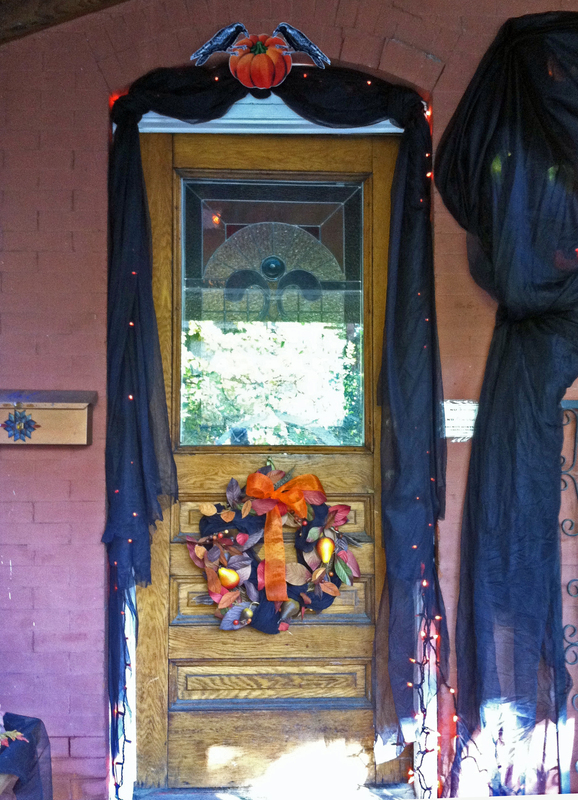 I added a little orange sparkly ribbon this year. The sign on the gate was an alley find: Free! 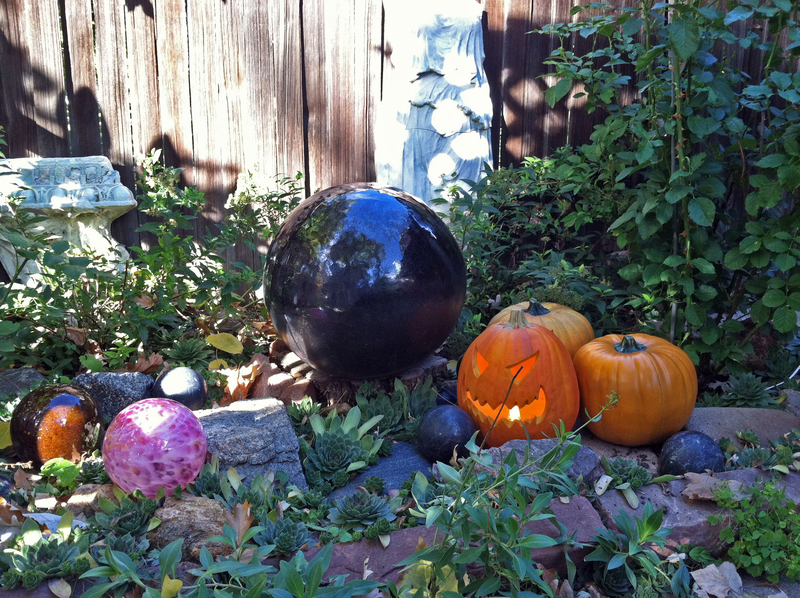 To the left just inside the gate is the “Ball Garden”, where I’ve added a few fake pumpkins. 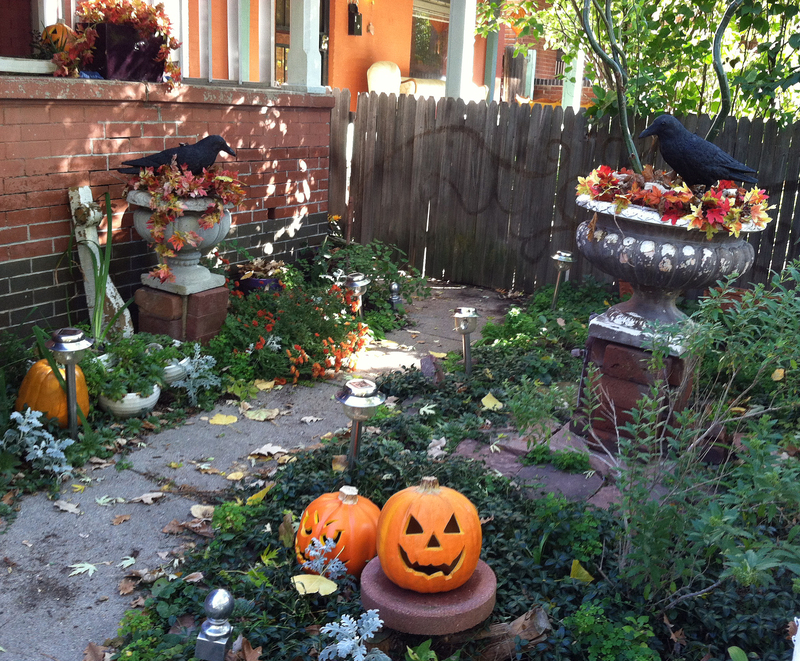 To the right, more fake pumpkins, and more foliage and crow decays in the tall pots. A little trick with the fake foliage: I fill the pots with real Fall leaves (we have no shortage of those this time of year! ), then add the fake stuff. It helps fill in the pots visually. 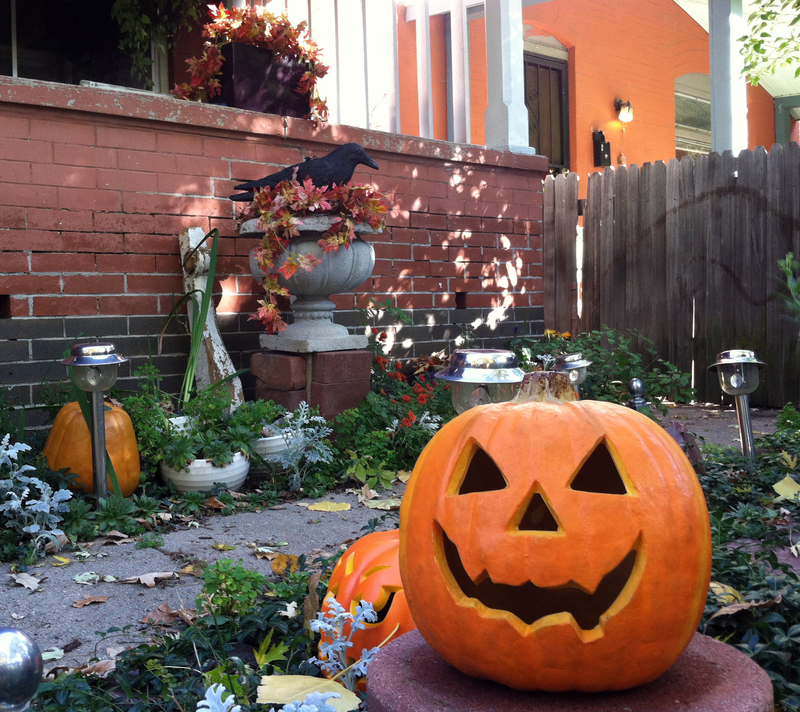 OK, I hear many of you purists scoffing at my fake pumpkins. Believe me, I’d have real ones if I could, but the ravenous army of squirrels around here would eat their faces off within 24 hours (unfortunately I know this from experience). 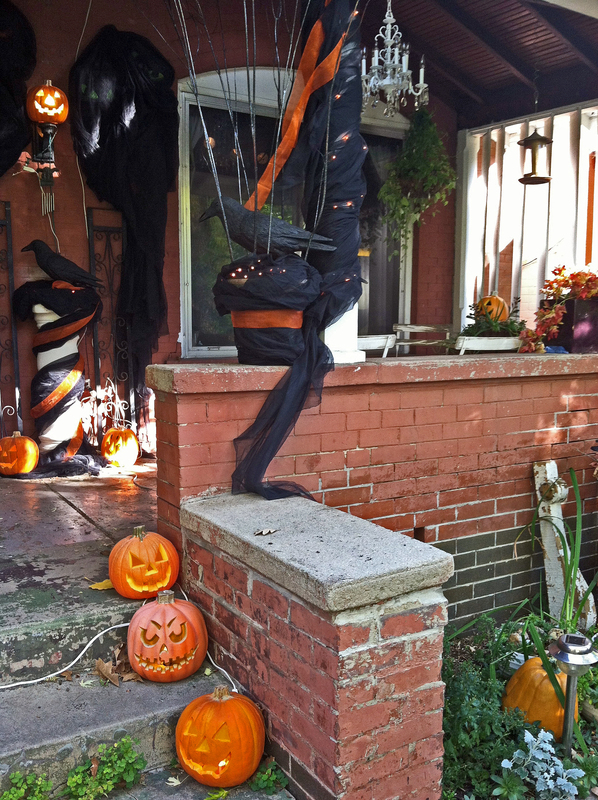 So faux pumpkins it is! We’ve been collecting these over the years from various thrift stores for a few bucks a piece. 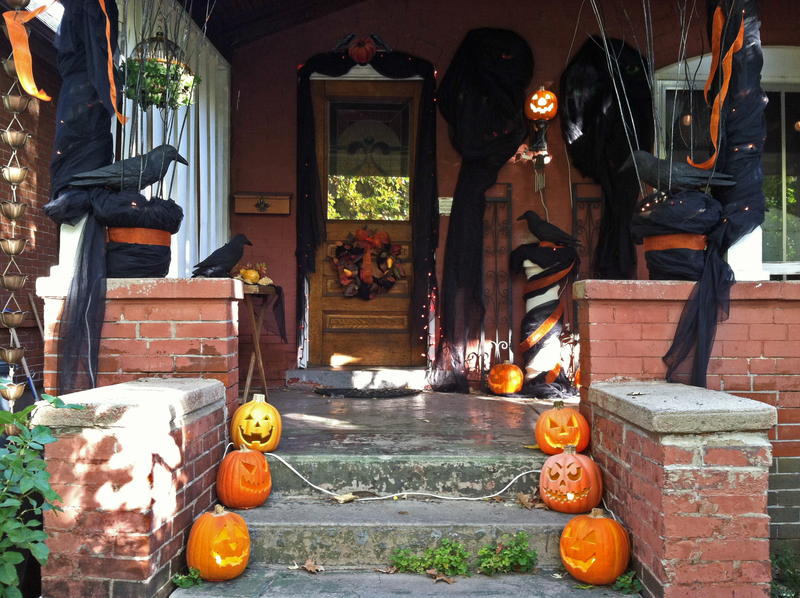 I continue the faux pumpkins up the steps (I still need to tape down the extension cords) and onto the porch (I do like a solid theme, I guess you’d call mine “Crows & Pumpkins”). 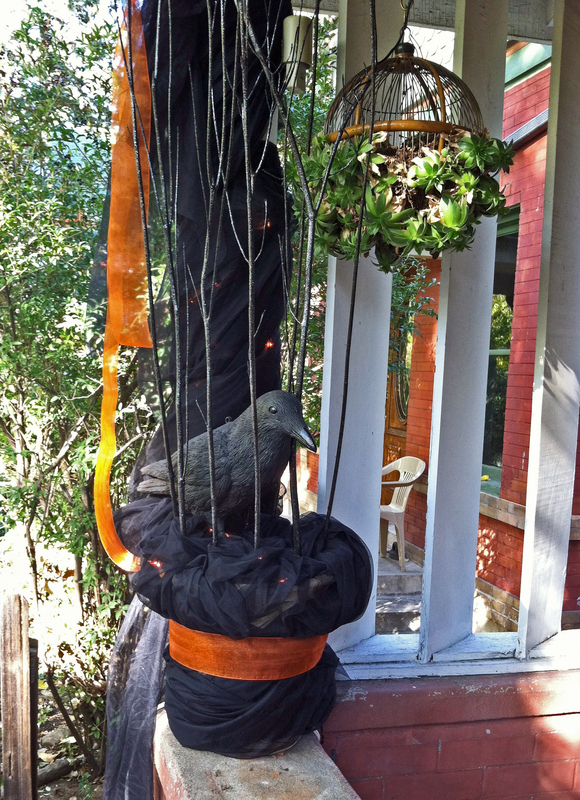 The two pots up on the stoop are also changed out for the seasons, and these I wrapped in translucent black fabric with a little orange ribbon, and there are strings of orange lights in the pots just under the crow decoys. This year I added the Glittery Black Sticks to the pots. They sparkle like crazy! 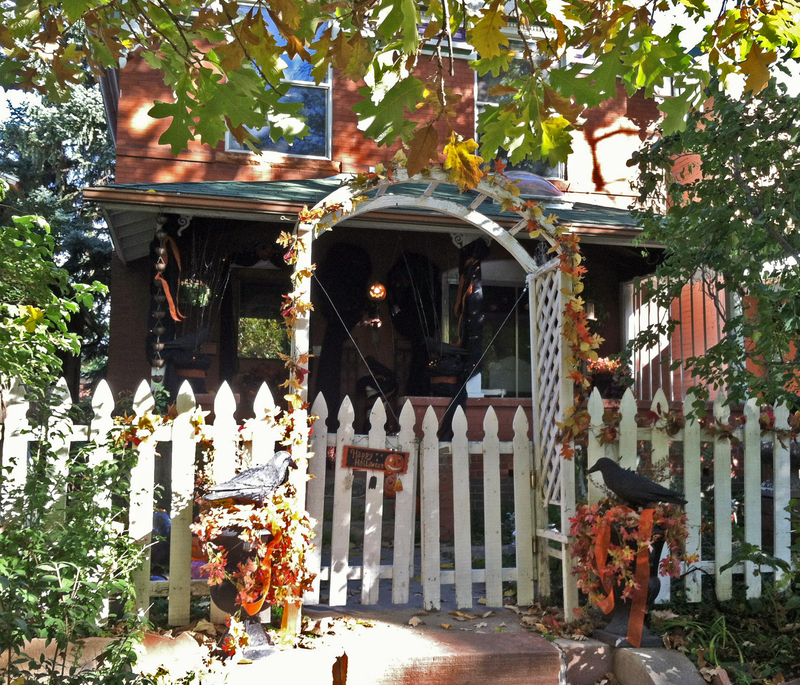 The columns on either side of the stoop are simply wrapped in more orange light strings and sheer black fabric, and topped with a little of the orange ribbon..
On the left side of the porch sits another fabulous alley find table, awaiting a paint job. 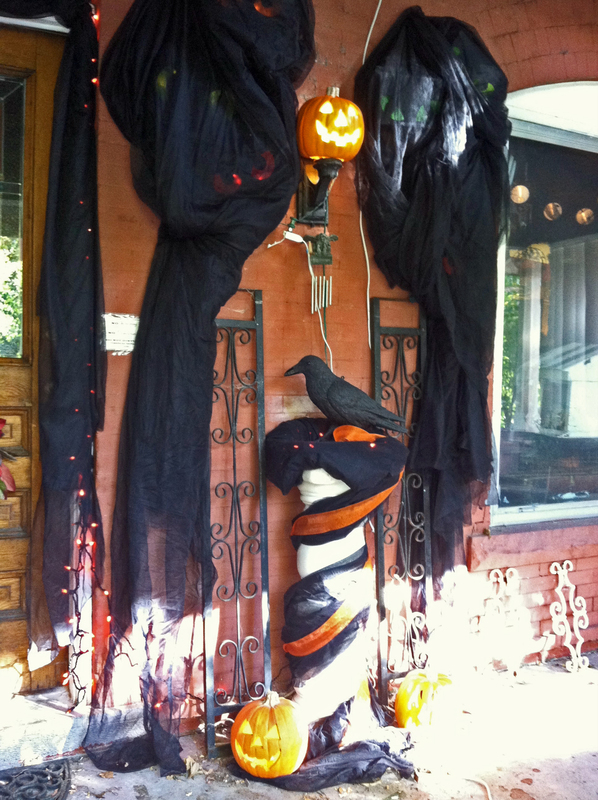 I dolled it up with more of the black fabric, some old dried out gourds (I save and dry out gourds every year, after they have been used fresh on the mantle inside), and of course, another crow decoy. 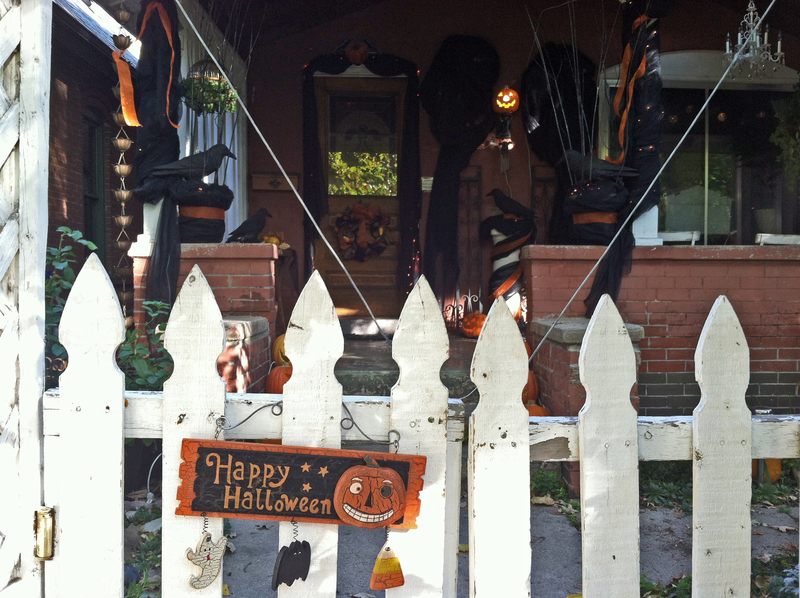 Almost everything in the yard came from the thrift store or is home-made. 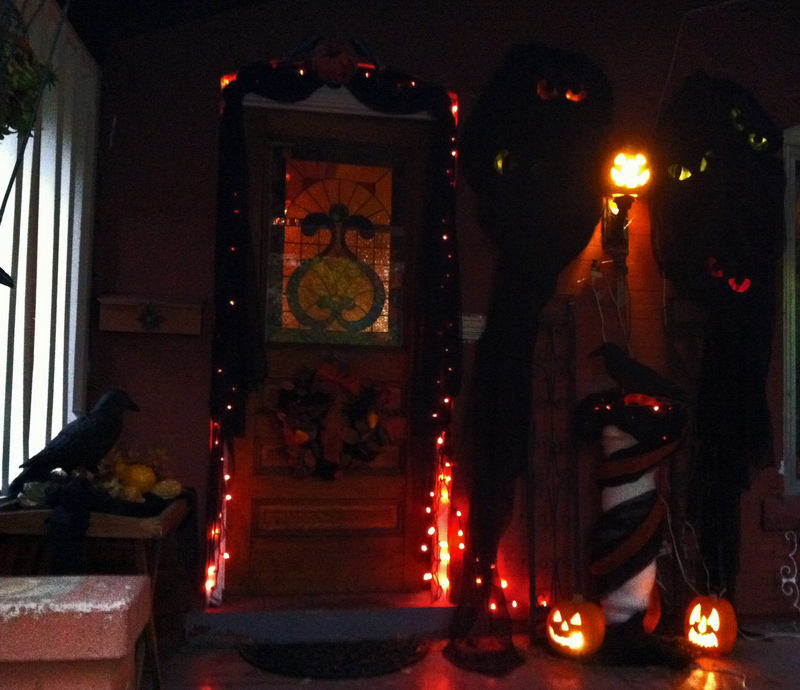 The only things I bought this year are the spool of orange ribbon and the sticks and glitter paint. Everything can be reused for years to come. 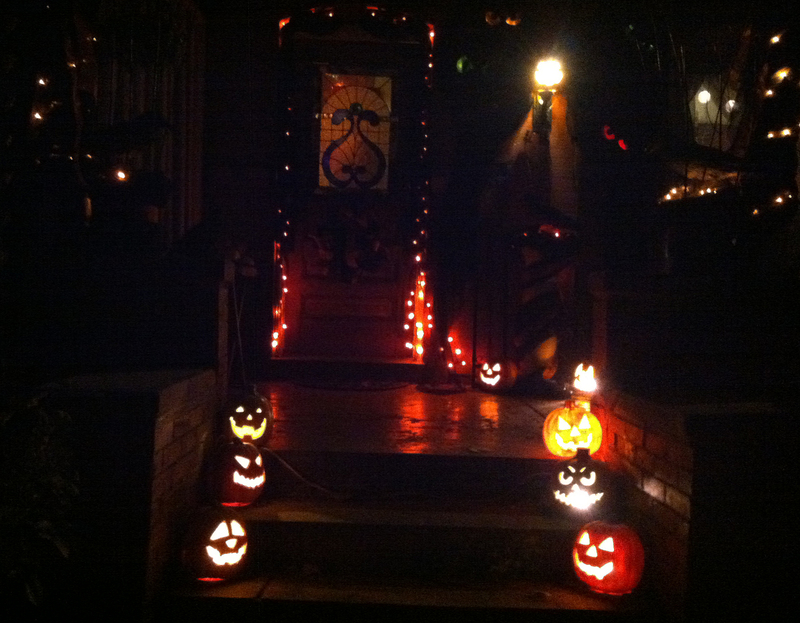 Next time, the inside of the house! 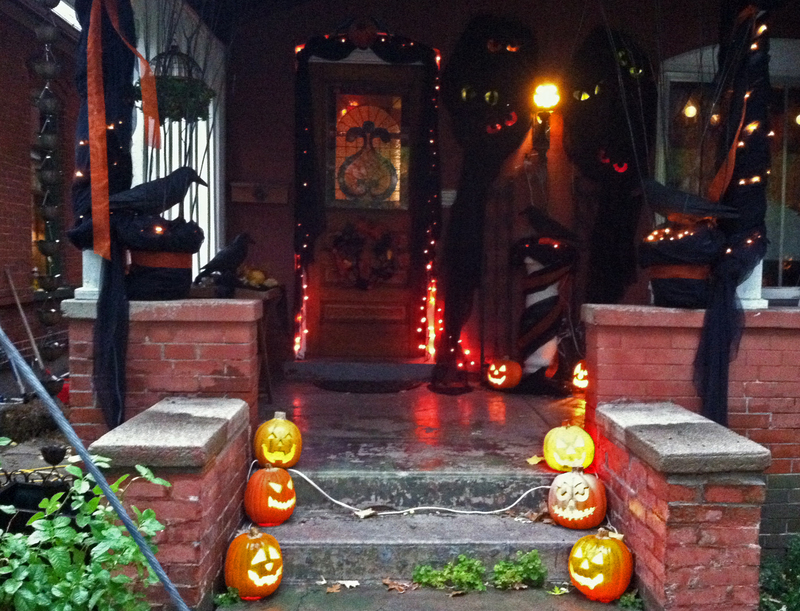 How did you decorate for Halloween? I’d love to hear about it in the “Leave a Reply/Comment section below. 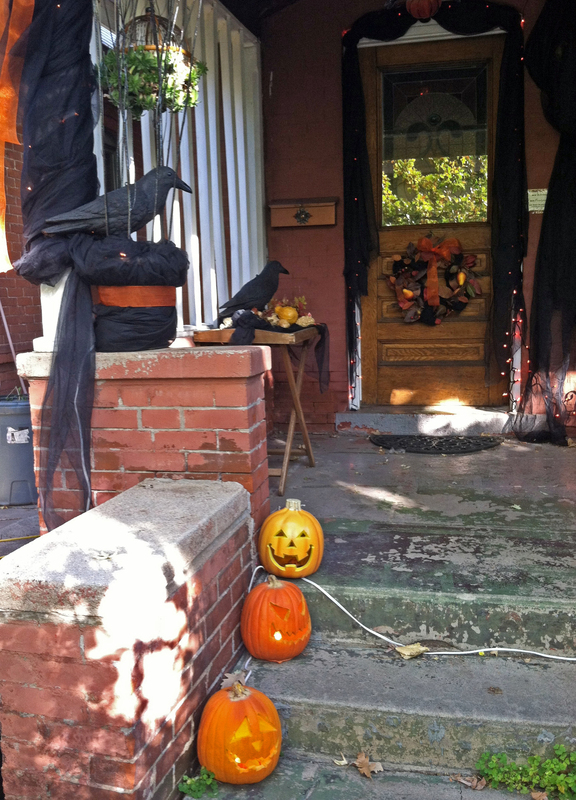 This entry was posted in decorating, DIY, Halloween, home and tagged blinking eyes diy, crow decoys, decorating, DIY, DIY Halloween decor, DIY Halloween Decorating, Elegant Halloween decorating, fake pumpkins, faux fall foliage, faux pumpkins, Gjoul eyes, Halloween, Halloween crow decoys, Halloween Decor, Halloween decorating, halloween eyes, outdoor Halloween decorating, victorian halloween decorating. Bookmark the permalink.